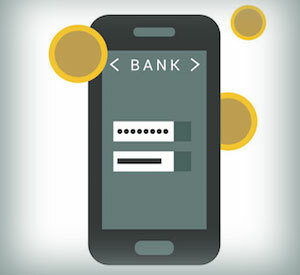 Research looking at the future-readiness of banking providers reveal what senior leaders are worried about, and what they might not be worried about enough. Cornerstone Advisors’ fifth annual What’s Going On in Banking? study surveys senior executives at community-based financial institutions (those with assets between $500 million and $40 billion) to understand their outlooks, concerns, priorities, and technology plans for the coming year. In addition, the study captures their assessment of their organization’s future-readiness across various functions, and their use of — and plans for — emerging technologies. The 2018 study revealed some “warning signs” — things senior bank and credit union execs are worried about, and some things they might not be worried about enough. 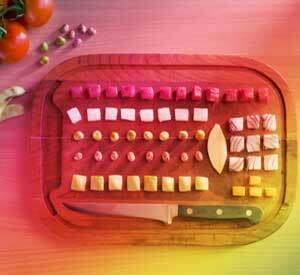 Sunny Days Are Here Again? Overall, nearly three-quarters of the bank and credit union CEOs surveyed are somewhat or very optimistic about 2018–roughly the same percentage as going into 2017, and a whole lot higher than 2016. 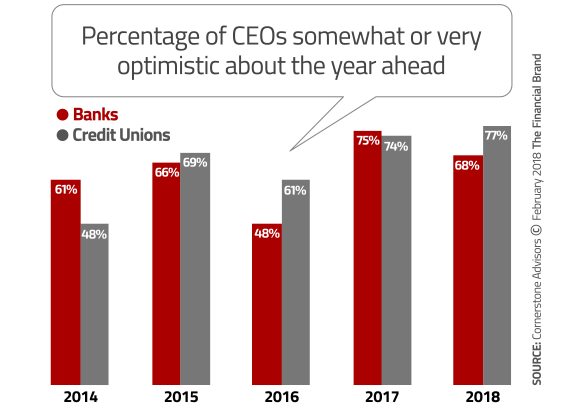 But there was a split this year by type of institution — fewer bank CEOs are optimistic, yet more credit union CEOs are optimistic. Why the divergence? My bet is that the decline in bank CEO optimism has to do with weakness in commercial lending, while credit union CEOs are optimistic because of the overall prospects for economic prosperity — despite challenges in the mortgage and auto lending businesses. Not a Care in the World? Optimism doesn’t mean the CEO don’t have concerns, of course. Roughly half of community bank CEOs listed the interest rate environment, cost of funds, and cybersecurity issues in their list of top three concerns. The first two saw big jumps from the percentage of banks CEOs who mentioned them as top concerns for 2017. Credit union CEOs don’t seem to be as bothered by cybersecurity threats as the bank CEOs, however. What are your top concerns for 2018? Despite the differences in opinions regarding cybersecurity issues, there is little difference between the two types of institutions as to their knowledge on cybersecurity matters. Roughly seven in 10 bank and credit union executives believe their firms are informed, and that their level of knowledge is improving rapidly. My take: Just because only 27% of credit union CEO listed cybersecurity concerns as a top three concern doesn’t mean it’s not a concern — it just didn’t make it into the top three. But considering how many community banks have seemed to give up on the retail market, it does seem odd that cybersecurity issues would make it into the top three concerns for bank CEOs and not credit unions. Regarding execs’ perceptions of their organization’s level of cybersecurity knowledge: It may be “improving rapidly” but I don’t it quite rises to the level of “informed. My bad for not providing a better prompt. Among a number of organizational functions, IT and digital banking are rated the most “future-ready” by both bank and credit union executives. Credit union execs may be getting worried, however — the percentage that rated those functions as even somewhat future-ready declined in this survey from the previous year’s study. In fact, their ratings of future-readiness declined in seven of the eight functions included in both surveys. My take: It’s disappointing (but not a surprise) to see analytics rated as future-ready by so few bank and credit union executives. It suggests a couple of possibilities: 1) financial institutions are only paying lip-service to the importance of building analytic capabilities, and/or 2) community-based institutions need a lot of help (beyond just slamming in technology tools) figure out how to build analytic capabilities. My money is on number two. An article here at The Financial Brand proclaimed 2018 “the year of AI and machine learning for financial marketers.” Nobody told community-based financial institutions. 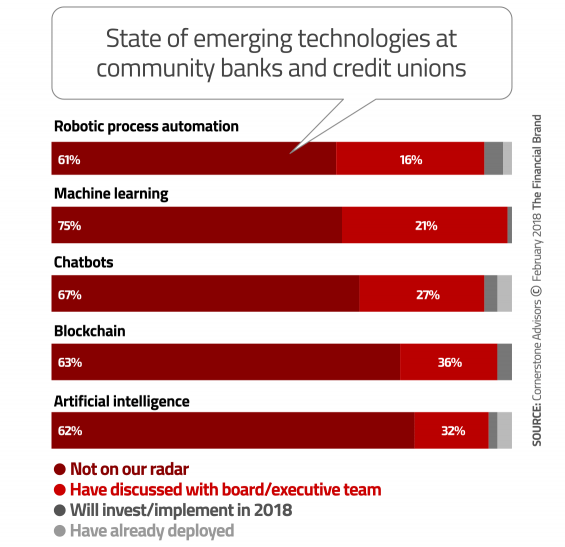 Deployment of technologies like AI and chatbots is practically non-existent at both banks and credit unions — and worse, not even on the radar at many banks. My take: While I don’t agree that 2018 is the year of AI for financial marketers, the absence of AI and other emerging technologies from banks’ radars is a warning sign. In the Cornerstone survey, we didn’t ask about the application of these technologies from a marketing perspective — we asked about them in general. Banks’ lack of conversations about how AI and machine learning can impact commercial lending, underwriting, and fraud management is a major warning sign. For a full copy of the What’s Going On in Banking 2018? report, click here. This article was originally published on February 14, 2018 . All content © 2019 by The Financial Brand and may not be reproduced by any means without permission.